Tpas :: Innovative. Creative. Insightful. Thoughtful. Innovative. Creative. Insightful. Thoughtful. 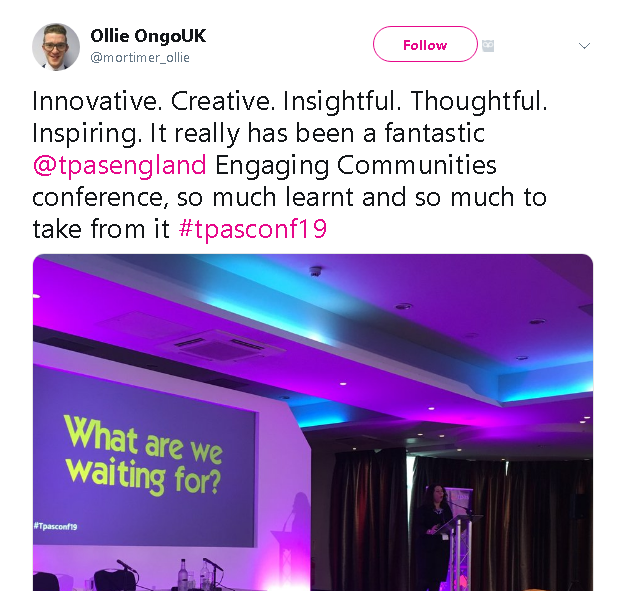 Inspiring is how @mortimer_Ollie tweet summed up our Engaging Communities Conference. When I read this, it really made me appreciate what a vital role this week’s conference plays in the Housing Sector. It is the only national conference that brings engagement professionals together to develop, learn and network. And this is so so important, as these are the people who make that “tenants at the heart of everything “mantra actually happen in their organisations. They are the ones striving to give all tenants a voice and challenging those in the organisation who don’t. They ares not about “othering” or thinking they know best, they are simply about being the best they can at connecting their customers to decision making, service improvements and organisational accountability. With this in mind, it was great then to see such a mix of people there too – those newish to engagement like Ollie, to those who have been around for ages and all those in between, all coming together to pick up new tools, share ideas , and learn new techniques to ensure they get engagement right in their organisations. I hope that many of them went way feeling like Ollie did, I hope that their organisations appreciate that they have a cracking bunch of dedicated and skilled staff, and I hope to see them all again at next years conference to hear all about their sucesses.